An old custom, that the progress and the modern facilities have extinguished it, is the are slaughtering of the pig. Each family grows in the courtyard of their house a pig in order to slaughter it during the days of feasts. The eve of the New Year’s day, the housewife was boiling in a cauldron a lot of water. The butcher with the help of other men was slaughtering the pig. After the slaughtering and the cleaning from the hair with boiling water, they were tearing the pig and then separate it into pieces: head, legs, intestines, gammons etc. The urinary bladder, otherwise called “fouska” of the pig, was given to the children to play after it was cleaned. The intestines were washed well and put in the vinegar. Small pieces of meat from the pig were put for eight days in the wine and then these pieces were inserted in the intestines to make sausages. The sausages and the meats of the pig were hanged afterwards and a fire smoked them in order to be dried. Afterwards they were led to the sun in order to dry them more. From the meat of the pig they ate all the year. The preparations for the Easter begin from the Saturday of Lazarus. This day the schools close for the Easter holidays. The children walk around in the village and sing the “song of Lazarus ». A child embellished with wildflowers (yellow daisies and “Lazaruses”) is the Lazarus. The child holds a piece from a date-palm preened with wildflowers. The other children sing the “song of Lazarus” the housewives give to them eggs or money. During the Holy Week, the women clean and tidy up their houses. In the previous years the housewives were painting the walls with white paint. 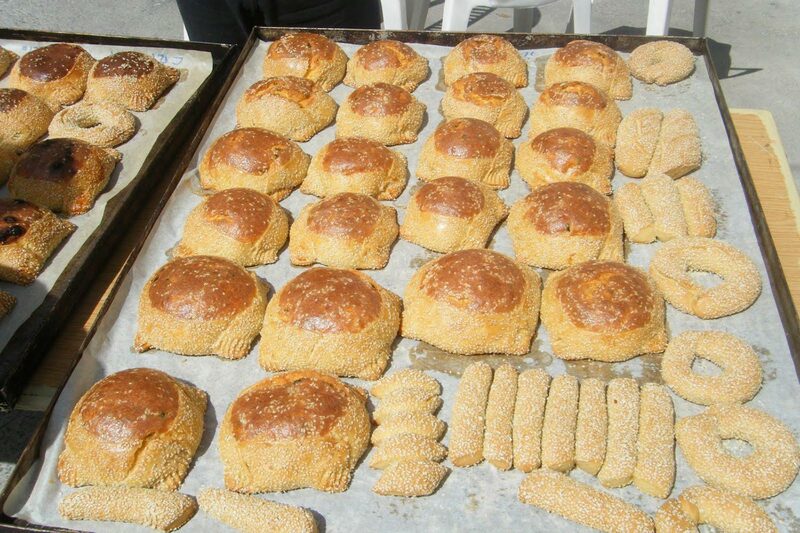 During the holy week from Wednesday up to Saturday the Easter buns and the “flaounes” are prepared . On Thursday the housewives dye the eggs. Today there are ready paints for the painting of the eggs. In the old years they used onion-leaves for the red, daisies for the yellow and leaves from almond trees for the green eggs. On Friday afternoon the Epitaph is embellished. The girls of the village go to the church with the flowers and they embellish the Epitaph.On Saturday morning the evening liturgy of the Resurrection takes place. As soon as the priest says “Anasta o Theos”, the black aprons fall and also the church chairs are strike hard. On Saturday afternoon, young persons carry at the church pieces from trees and other timbers. They place them in a pile and they summit an effigy of Judas. They put fire on the timbers and they are gathered around the fire. In the fire of “Lampratzia” they burn the “girls of March”, a spinner that they had on their finger from the 1st of March (in order to prevent burning from the sun). At midnight the bells call the Christians to come to the church. They all hold candles. At 12pm the lights are turned off. The priest comes out at the Holy Gate with three candles and sings the “Defte lavete fos”. They all chant “Christos Anesti” and the children turn on their fireworks. 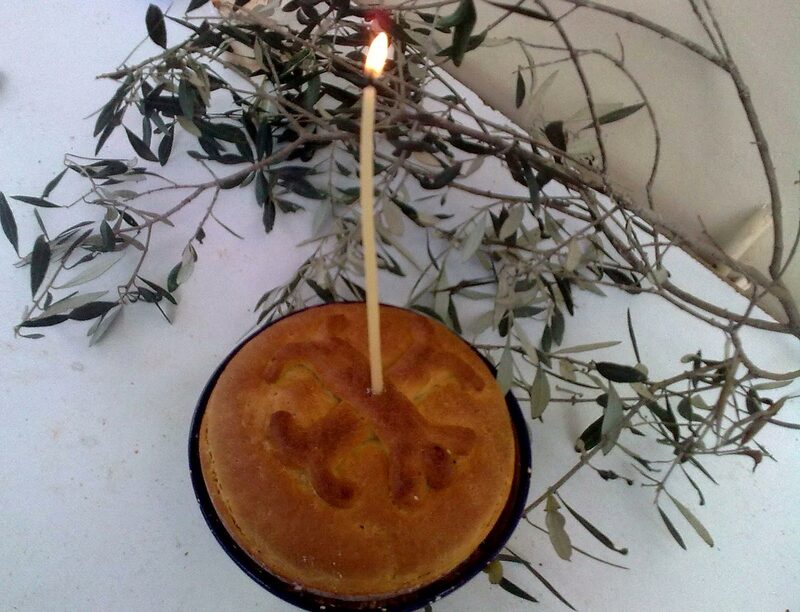 They also exchanged the wishes “Christos Anesti – Alithos Anesti”. The midday of Sunday Easter takes place the liturgy of Love where the Gospel is read in different languages. In older seasons during the afternoon, various games were taking place at the yard of the church like baths, rope, camel, “ziziros” etc. There were heard songs like:”Thee mou nartan oi lambres na kremmastoun oi sousses, kai na gemisoun ta stena oullo mavrommatouses ». The girls of the village were sitting on the” souses” and singing. The celebrations were continued for three days. The cafes were filled completely with people. Unfortunately this custom has been suppressed some years ago. In its effort, the Community Council on resurgence of the old customs of Easter, it organizes an event on Monday of Easter at the courtyard of the municipal school of the community, where resurgence of old customs and old games of Easter takes place. The residents of our village have the habit to celebrate the Carnivals on Saturday and Sunday of “Tyrofagou”. Many of them are disguised in old women, olds, soldiers, doctors or nymphs dressed with white clothes. The evening after the sunset, teams of masqueraders go around from house to house in the village and from anywhere you are you can hear the laughs and the voices of the masqueraders. The evening of Sunday, two-three families are gathered in a house in order to celebrate and entertain the Carnivals. When the entertainment is at climax, the masqueraders dash in the houses and begin their jokes. They dance strange extraordinary dances and ask for some drinks. After they give them something to drink like wine, “zivania”, cognac or something else, they offer to them some food and the masqueraders move to other houses. At the duration of the party they sing various songs. During the old seasons, on Green Monday, they were all going outside of the village. Others on their feet and others with the cars were going to a location called “Larkoua”, a very beautiful locality at the East Side of the village. Almost all the village was gathered there, even a lot of foreigners that came and to cut the “Moutti tis Sarakostis ». They were all bringing their fasting foods there and were having fun. Near there existed and still exist two taps, that this season have crystal water and refresh those who are thirsty. Afterwards the junketing, dances songs and games begun. Today the citizens gather, for the cutting of the ” Moutti tis Sarakostis”, the region of the river “Gialias”, where a rock built dam is found and also other regions of the community.